This is a larger than average, non-estate, detached family home located within the property village of Dunholme, close to Welton. The property has been improved and extended by the current owners and offers internal accommodation to comprise of Reception Hallway, Lounge, formal Dining Room, Utility Room, ground floor WC, modern fitted Dining Kitchen and First Floor Landing giving access to four Bedrooms, Family Bathroom and Separate Shower Room. The Master Bedroom has a Dressing Room and Balcony overlooking the rear landscaped garden. Outside there are well stocked landscaped gardens to the front and rear, a sweeping blocked paved driveway providing off road parking and giving access to the double garage and a triple tandem garden to the other side. Viewing of the property is highly recommended. LOCATION Located in the popular village of Dunholme, to the north of the historic Cathedral and University City of Lincoln. The village, along with Neighbouring villages of Welton and Nettleham, offers a good range of amenities including schools, shops, public houses and leisure facilities. 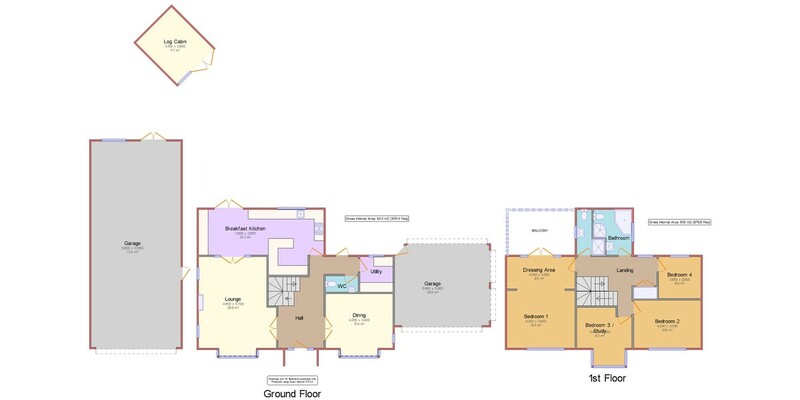 RECEPTION HALL 18′ 8" x 9′ 2" (5.69m x 2.79m) , with UPVC leaded window and a door to the front aspect, glass panelled double doors to the lounge and dining room, door to the WC, utility room and kitchen, stairs to the first floor landing with storage below, radiator and UPVC door to the rear garden. DINING ROOM 13′ 7" x 13′ 8" (4.14m x 4.17m) , with walk-in UPVC leaded bay window to the front aspect, UPVC leaded window to the side aspect, wooden flooring and a radiator. LOUNGE 18′ 9" x 13′ 8" (5.72m x 4.17m) , with walk-in UPVC leaded bay window to the front aspect, UPVC leaded window to the side aspect, wooden flooring, wall mounted fireplace with granite hearth and marble surround, double glazed doors with side glass panels leading to the kitchen diner and double glass doors to the hallway. KITCHEN DINER 25′ 3" x 9′ 4" (7.7m x 2.84m) , with UPVC window and double doors to the rear aspect, wooden flooring, fitted with cream base units and drawers with granite work surfaces over, Belfast sink unit and granite drainer with mixer tap above, five ring gas hob with extraction above, integral double oven and combination microwave, integral dishwasher, American style fridge freezer, full height display storage cupboard, wall mounted units with complementary tiling below and a breakfast bar. UTILITY ROOM 7′ 1" x 7′ 1" (2.16m x 2.16m) , with UPVC window to the rear aspect, tiled flooring, fitted with base units and drawers with work surfaces over, stainless steel sink unit and drainer with mixer tap and water softener, space for automatic washing machine, full height storage cupboard, wall mounted gas central heating boiler, chrome towel radiator and tiled flooring. WC With tiled flooring, partly tiled walls, radiator, WC and wash hand basin. FIRST FLOOR LANDING With UPVC window to the rear aspect, doors to four bedrooms, bathroom, shower room, fitted wardrobe and double doors to the large airing cupboard with shelving. DRESSING ROOM 13′ 9" x 6′ 6" (4.19m x 1.98m) , with UPVC window and double doors to the balcony, fitted bedroom furniture, radiator and archway to the main bedroom. MASTER BEDROOM 11′ 10" x 11′ 8" (3.61m x 3.56m) , with UPVC leaded window to the front aspect, radiator, fitted wardrobe and bedroom furniture. BALCONY With tiled flooring, wrought iron balustrade, views over the garden and a Vita spa Joli hot tub with remote controlled electric awing canopy. SHOWER ROOM 3′ 2" x 9′ 7" (0.97m x 2.92m) , with UPVC window to the rear aspect, tiled flooring, tiled walls, suite to comprise of shower, WC and wash hand basin and a chrome towel radiator. BATHROOM 9′ 6" x 8′ 0" (2.9m x 2.44m) , with UPVC window to the rear aspect, suite to comprise of corner bath with air jet and spa facility, WC, wash hand basin with vanity cupboard and separate shower cubicle, tiled flooring, tiled walls and radiator. BEDROOM 2 9′ 11" x 13′ 8" (3.02m x 4.17m) , with UPVC leaded window to the front aspect and radiator. BEDROOM 3 8′ 9" x 8′ 7" (2.67m x 2.62m) , with UPVC window to the rear aspect and radiator. BEDROOM 4 11′ 4" x 12′ 0" (3.45m x 3.66m) , with walk-in UPVC leaded bay window to the front aspect, wooden flooring, radiator and built-in furniture to comprise of computer desk, high level glass cupboards, tall cupboard and drawers. OUTSIDE To the front of the property there is a mature well stocked garden and an extensive blocked paved sweeping driveway providing off road parking and giving access to the double garage and the triple tandem garage. To the rear of the property there is a paved seating area with planters and steps up to a lawned garden with a summer house, pagoda, pond and a water feature. SUMMER HOUSE 11′ 11" x 10′ 3" (3.63m x 3.12m) , with double doors to the front aspect and a covered seating area. (Included in the sale). DOUBLE GARAGE 15′ 6" x 18′ 5" (4.72m x 5.61m) , with retractable electric roller doors to the front, side and rear aspects and paved flooring. TRIPLE TANDEM GARAGE 17′ 6" x 42′ 1" (5.33m x 12.83m) , with electric roller door to the front aspect, door and windows to the rear and side aspects and Velux windows to the ceiling. The triple garage also has a 415v supply. To the rear of the garage is an enclosed patio area/courtyard.